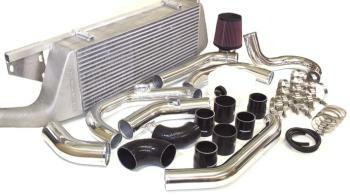 Treadstone Intercooler Kit - Dezod Motorsports Inc - Home of the automotive performance enthusiast since 2002. The bomb has landed and the news is out, we have blew the competition away with this one. Treadstone massive front mount intercooler kits are available for a number of vehicles. With many of our private label intercoolers already on the market today, these units are tried and tested on the track and the strip by many of the top names in tuning. Forget about heat soak, with this monster you can run on the track all day with out ever worrying of loosing horse power due to heat soak. We have field tested this with efficiencies of up to 95%! Incorporated into the design is a front frame brace which takes place of the bumper support and maintains front structural integrity of your vehicle. Our intercooler core uses top quality pure aluminum alloy making our intercooler lighter than the competition even with a larger overall size! The Treadstone name has become synonymous with quality intercoolers over the past few years, and we pride our selves on it! We manufacture our bar and plate cores with strict guidelines, and are specifically designed to maximize cooling using the most surface area possible in any given space. Our cores give the perfect balance between heat exchanging efficiency and flow. Our internal fin structure design is top notch, and is where the most important changes can be made to enhance the cooling rate. Treadstone intercooler cores feature a high heat-dissipating “Inner fin” design. This is ideal for medium to high boost levels on higher horsepower or upgraded turbo engines. The larger internal surface area provides superior cooling efficiency for radiating excessive heat and minimizing heat soak. In general, these design characteristics is what gives Treadstone Intercoolers the leading edge in intercooler technology.